We all know that proofreading is important—it doesn’t matter if you’re a native speaker or just learning English. Nothing is worse than turning in a project you worked hard on, only to discover that it’s full of typos, misspellings, and grammatical mistakes. But proofreading your own writing is tough. Sometimes your brain sees what you meant to write instead of what’s actually on the page. Luckily, there are tactics you can use to make proofreading easier. 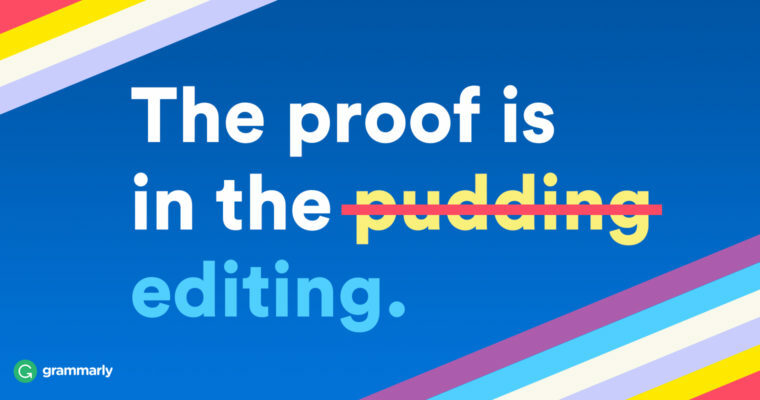 Give these nine proofreading techniques a try and catch your writing mistakes before your readers do. When you have to edit your own work, it’s a good idea to take a break after you finish writing. Do something else for a little while. Your brain needs some time to forget a little bit about what you wrote. When you come back and start proofreading, it will be easier to look at your work from the perspective of your readers. If English isn’t your native language, this is especially important. You’ll spot mistakes you missed before because you’ll be reading what’s actually on the page instead of just remembering what you meant to write. Make your document look less familiar by changing the format. Try printing it out, changing the margins, or changing the font. When the text looks different from what you’re used to seeing, you’ll pay more attention to it and you’ll be less likely to start skimming. Reading your writing aloud will help you find sentences that are hard to understand. Did you need to stop and breathe in the middle of a sentence? That’s a good indication that the sentence is too long. Are there places where you stumbled over your words? Your readers will get confused in those spots too, so it’s a good idea to rewrite them. Added bonus: this is always a great trick for improving your English pronunciation! Start at the last word of your document and work your way to the beginning, one word at a time. This is a great way to spot misspellings and repeated words. Reading backward helps you concentrate on individual words without getting distracted by the topic of the sentence. The best proofreaders have one thing in common. When they are proofreading, they read very, very slowly. If you’re naturally a fast reader, it can be surprisingly difficult to slow down and really examine your writing. Try using your finger to point at each word as you’re reading. It’s a good way to force yourself to stop and really look at everything you’ve written. Nobody likes being reminded about past mistakes, but in this case, a list of them can help you avoid making the same mistake twice. Maybe you tend to mix up “there” and “their,” or maybe apostrophes and possessive nouns give you trouble. Write down your most common mistakes and make a note about the correct usage. Keep the list near your computer so you can easily refer to it while you’re writing. Having the answer handy will save you time in looking it up. Over time, you’ll probably find that you need the list less and less. Titles and headings are the first things people look at, but it’s surprisingly easy to overlook mistakes in them. Double-check every title and heading in your document. If your document contains a numbered list, make sure the numbers are in the right order. English prepositions (words like in, on, to, from, by, about) are tricky. Often, they don’t follow a logical pattern. Do you comply with a request? Or do you comply to a request? A tool like Google Ngram Viewer can show you which phrase is more common in English. It’s a helpful starting point, but remember that the tool won’t define the phrases for you. You’ll still need to check a dictionary if you aren’t sure about the meaning of the preposition. Bloggr’s online writing app not only checks your spelling and grammar but also suggests style and vocabulary improvements. You can create a free account and upload a document, or you can download the free Bloggr browser extension, which will correct your spelling and grammar whenever you write something online. Bloggr’s AI-powered products help people communicate more effectively. Millions of users rely on Bloggr every day to make their messages, documents and social media posts clear, mistake-free, and effective. A version of this post originally appeared on blog. Был найден мной авторитетный web-сайт на тематику сколько стоит суррогатная мать.